‘Exercise improves your physical condition and fights diseases better' is something we have heard quite often, but did you know that exercise is the best way to de-stress too? The Department of Health regards sedentary lifestyle as a ‘silent killer'. Exercise decreases your risk of many chronic diseases, such as heart disease, stroke and diabetes which are also caused due to high stress levels. An improved self esteem is one of the most advantageous benefit got by regular exercise. Physical exercise releases feel good or happy hormones, also called endorphins. These are chemicals in the brain that act as natural pain killers and immunity enhancers which has a negative effect on stress. It improves the ability to sleep, which in turn reduces stress. Exercise in any form tends to relax tense muscles and tissues which helps to relax stress related aches and pains. Be it dancing, walking, gardening, jogging or brisk walking along with a friend or a companion, exercise is a good diversion to your mind from thinking about your problems. It's a good way to shed your irritations and help you feel calmer, clearer and optimistic with higher energy levels. A good way to de - stress with exercise is to select a sport or a physical activity that interests you so that that you are kept motivated. 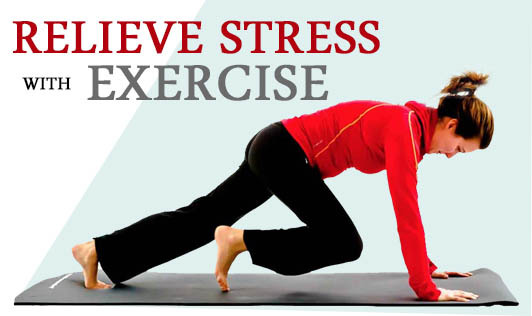 Any form of physical exercise will help you combat stress. So start with at least 20 to 30min of physical activity and gradually increase it to about an hour over 3 months. Enjoy the benefits of staying physically active!